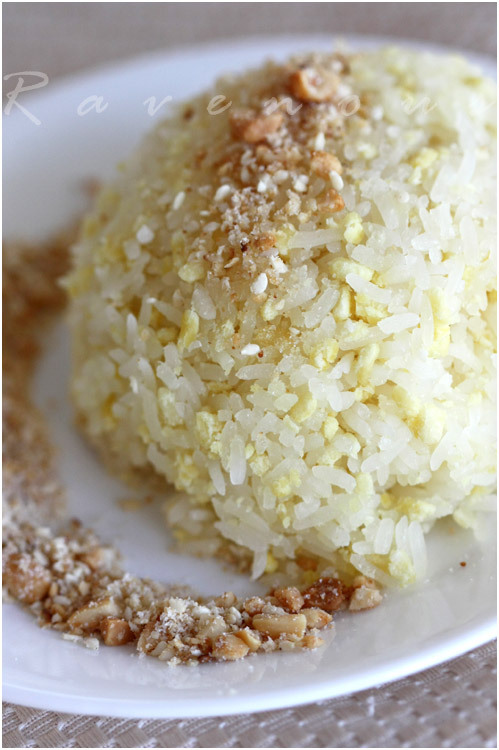 Xoi vo is a subtly sweet glutinous rice that is made of with crumbled/crush (vo means to crush/crumble) mung beans. 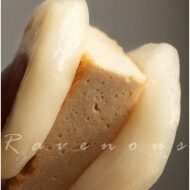 The consistency is more loose and dryer compared to other sticky rice such as xoi man, pandan sweet rice (xoi la dua), and xoi bap. This type of sweet rice is versatile because it can be eaten as breakfast, a snack, or a side dish to a dinner. As I grew up, I always wondered why my aunt, bac chin (nine), would use fabric to make xoi vo. I thought the yellow color of xoi vo came from the yellow muslin fabric she used, but now I realize the beautiful yellow color comes from steaming the rice and the yellow mung beans together. Soak the glutinous rice and yellow mung beans separately for at least 8 hours, but preferably overnight. 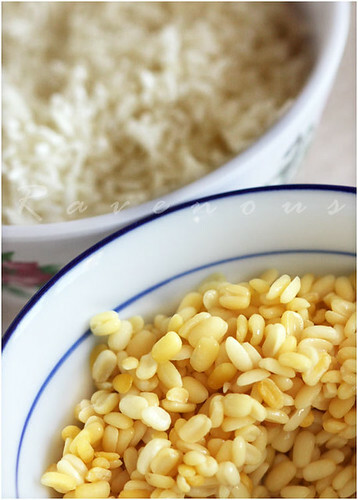 Drain the glutinous rice and mung beans separately and let them dry naturally. Steam the mung beans for about 20-30 minutes. When cooled, mash the mung beans into thick paste with small clumps. 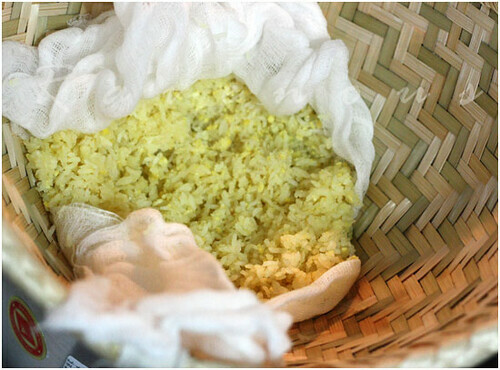 Mix the rice, salt, and mung beans and place the mixture in a steamer with a cheesecloth or muslin. Steam for about 15-20 minutes or until rice is done when soft and loses it’s opaqueness. When done, add the coconut milk and mix gently being careful not to mush the rice into clumps. Mmm. I love all forms of rice. I love your sesame/peanut river too! Dang, next time I'm in LA, forget the restaurants….I'm going to your house. 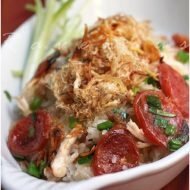 There's so much stuff you post here that I don't see in the NY restaurants, though I've kind of given up and stopped going to Vietnamese restaurants here. Love mung beans! Especially when they are made into vermicelli Lovely presentation of the rice. I also love mung beans. We koreans eat fried mung bean pancakes. Have never had them with rice strangely enough but this looks good! Looks great! You have really exposed me to so many types of Vietnamese food that I've never heard of! I love sticky rice. See you at the Foodbuzz conference? The Little Teochew: Never tried it with vermicilli noodles but sounds delish! Yutjangsah: Korean pancakes with mung beans sound so good right now:) We also put mung beans in Vietnamese crepes as well too. Gastronomer: thanks for sharing. we're becoming xoi fiends too! Jen @ TinyUrban kitchen: That's great! We love opening folks up to many types of Vietnamese food. Thanks for sharing so many diverse asian recipes and sweet deserts! It's true there aren't too many good authentic Vietnamese restaurants in New York. I find your posts intriguing, giving me dish after dish to aspire. Fresh Local and Best: Although there aren't too many good authentic Vietnamese restaurants, we miss New York! Thanks for stopping by! I am bookmarking this ……shall try sometime and will let you know. Aw, I don't have a steamer. I've always wanted to try making this at home. Is there another way? Oh.. I love the bamboo steamer. May I know where you got it? It's a traditional steamer in Indonesia too. 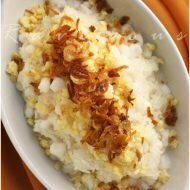 I've never tried this kind of rice.. looks delicious! Wow. Xoi vo` is my favorite. You can make everything so yummy. Nidhi: Let us know how xoi vo goes for you! Anna: A bamboo steamer is pretty cheap! On amazon, it's around 13 bucks…or your rice cooker may have one..let us know if you make it! Selba: mung beans are so versatile! tuty: we got it at a local asian grocery, but you can buy it on amazon too! Zoe: Thanks for your support…we try our best! this dish brings back so many childhood memories. i could eat bowlful after bowlful! Up north, we call this stuff xoi xeo (xôi xèo). My favorite breakfast food, with crispy fried shallot shavings as well as the peanuts! You can’t cook the mung beans and rice in a rice cooker together on short, sweet rice setting? My rice cooker comes with different settings for each type of rice grain. we haven’t tried cooking the sweet rice in the cooker but it’s worth a shot! How long do you let them “dry naturally” after soaking? 30 mins… couple hours?